Whether vactioning in Los Cabos for a family vacation, a romantic weekend or a golf getaway there is so much to do. The trick to making your vacation in Mexico a success is choosing the right location and activities to keep everyone happy and entertained. Luckily, there is no shortage of things to do with a family or as a couple in Mexico. and there are just as many places to stay in Cabo where you'll be pleased to find top-of-the-line accommodations and special attentions perfectly designed for small children and big kids alike. Traveling to Mexico with children provides a memorable cultural experience for kids of all ages, as well as an effective and fun way to introduce children to the rich history and traditions of Mexico. Incorporating the educational benefits of a family vacation in Mexico has never been easier, or more fun. From beach and water sports, to eclectic cuisine, the opportunities to experience the authentic flavors of Mexico abound! 1) Get a crash course in Mexican history at museums and art galleries Local artisans abound in San Jose del Cabo, and you don't have to look far to appreciate the works of these artists. Stop by the local museums for a more academic excursion, and marvel at the architecture of the Iglesia San Jose. Explore the local exhibits and crafts, and pick up souvenirs to remember Cabo by forever at many unique galleries and local vendors. 2) Beach & water sports Kayak out to the famous stacks and see the arches from a whole new perspective. Kids and parents will delight in boogey boarding the beaches and for the adventurous, there are surf lessons, stand up paddling lessons and snorkeling aplenty. 3) Hiking, biking, sightseeing With its impeccable weather, being outdoors on a Mexico vacation is a pretty easy sell. Prep with sunscreen and explore the trails and turf of San Jose del Cabo for photos and memories perfect for the kids to bring home for show and tell. Take a short road trip to the East Cape or Todos Santos, home to Hotel California -- there is much to explore. 4) Taste the flavors of Mexico Authentic cuisine not to be missed abounds in Los Cabos. From generations-old Mexican recipes to Mexican-influenced Thai food, the journey is half the fun in finding your family's favorite spot to eat. We're happy to recommend our favorite restaurants to you! 5) Learn Spanish and practice with locals Planning a vacation to Mexico with your kids? There is no better opportunity to introduce little ones to Spanish phrases and vocabulary than before you even board a plane. Then, when you arrive, get ready to practice and have fun learning and trying out a foreign language together. 6) Wildlife tours & whale watching Famous for its biodiversity, Cabo is an ideal location to satisfy the budding marine biologist in your family. Watching pods of whales migrate past will make memories to last a lifetime and is sure to inspire the whole family. Birding at Paseo del Estero provides an unparalleled experience to see frigate birds and a variety of other rare and breathtaking species. Don't forget you can also swim with the dolphins in Cabo San Lucas! For more ideas and information about accommodations or things to do in Cabo, contact Realty World Baja Realtors to learn more about booking your Cabo vacation rental today! Have questions about owning property in Mexico? Let us know! We're happy to answer them for you. 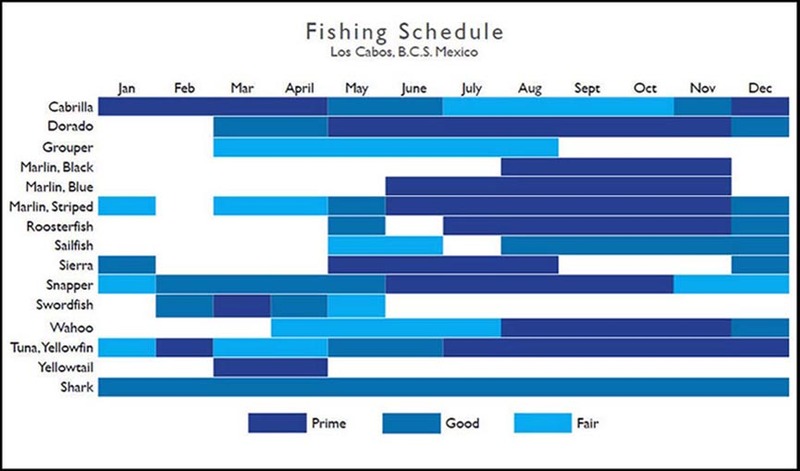 Mexico is synonomous with legendary deep sea fishing. If you're a serious fisherman, there's no excuse not to be in Los Cabos or San Jose del Cabo any time of the year to seek out marlin, yellowtail, and other exotic fish in the beautiful ocean waters surrounding our area. It's one of our hidden secrets.